Following successful participation in the tender process, the contract for the construction of the new CARDDIAB research building of Düsseldorf University Hospital was awarded to Nickl & Partner as the general planner of the bidding consortium with IB Süss, dr. heinekamp, Krebs+Kiefer, Müller BBM, Rainer Schmidt Landschaftsarchitekten as well as N&P Baumanagement. The new building is to provide the research infrastructure required for translational and preclinical science in the fields of cardiovascular diseases, diabetes/metabolic disorders and related environment-associated diseases. 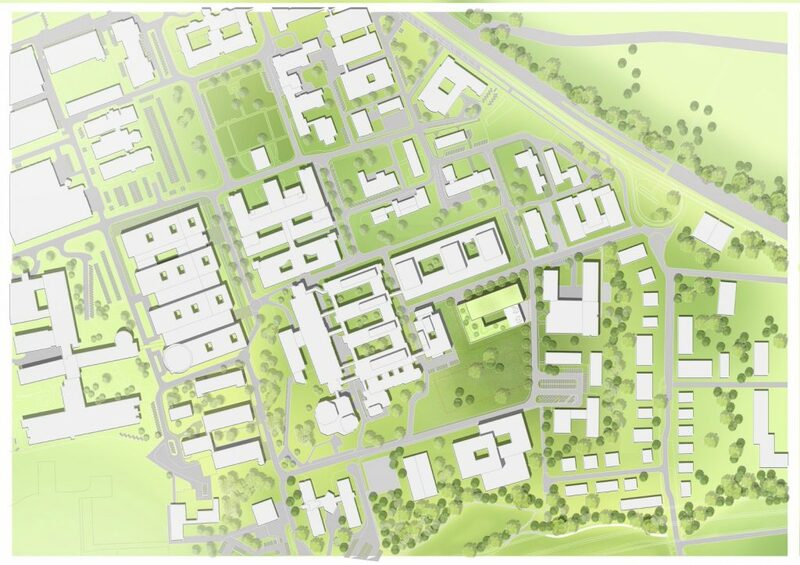 Our concept takes both the integration into the existing campus of the university hospital and future construction plans into account. At the same time, we want to create a separate floor for the participants in clinical trials, which offers them privacy and an outdoor space in the form of a roof terrace. The three-storey building blends in with the surroundings. A fourth floor here and there creates a link to the city. We are pleased about our new project in Düsseldorf!